Island in an Island – Naming a blog is harder than naming a kid. 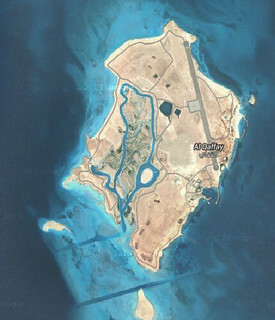 I don’t remember why I was poking around at the general Qatar/UAE area on google maps, but Owen saw islands in the Gulf and wanted to look more closely at them (“zoom in! zoom in!”) so I did, and this is one that we looked at, and he noticed that it has an island in an island, and loved it for that. It became his favorite island in that moment.